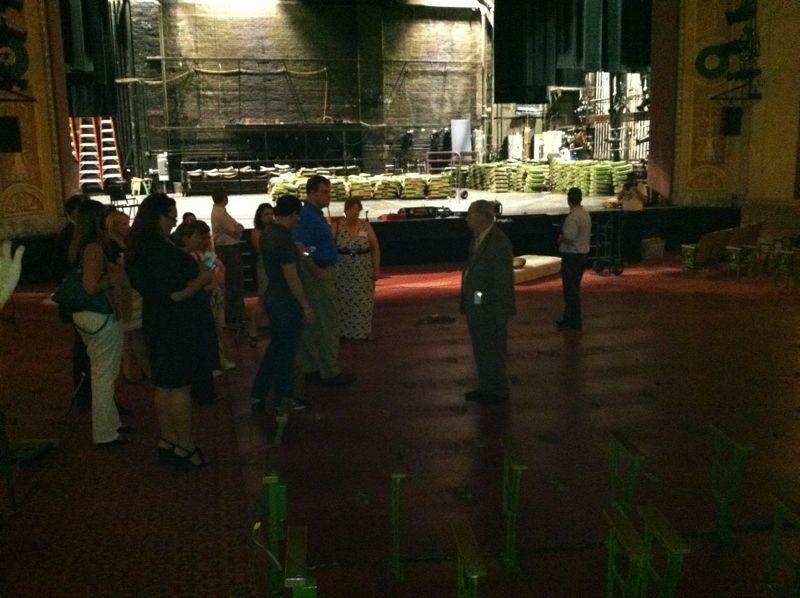 On Wednesday, July 11, 2012, we were very fortunate to be able to participate in a private tour of Playhouse Square (PlayhouseSquare.org - @PlayhouseSquare), sponsored by the Ohio Blogging Association - Cleveland (@OHBlogging) and Playhouse Square Partners. 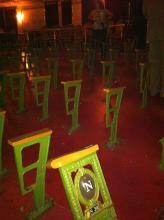 We saw parts of several theatres that the public normally does not see. 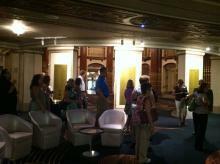 Our group gathered in excited anticipation in the Palace Theatre lobby for the 7:00 p.m. tour. We were then split into two tour groups, since this event proved to be quite a popular one! Our group started out in the Palace Theatre with its beautiful, traditional proscenium arch stage. 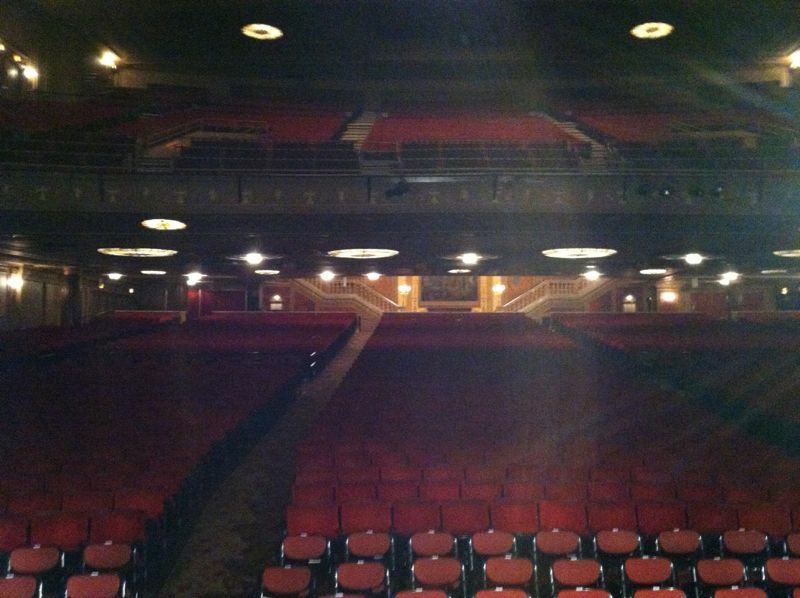 This theatre always brings back special memories to us of our sons’ high school graduations, as well as the many Broadway Series productions we have seen there. 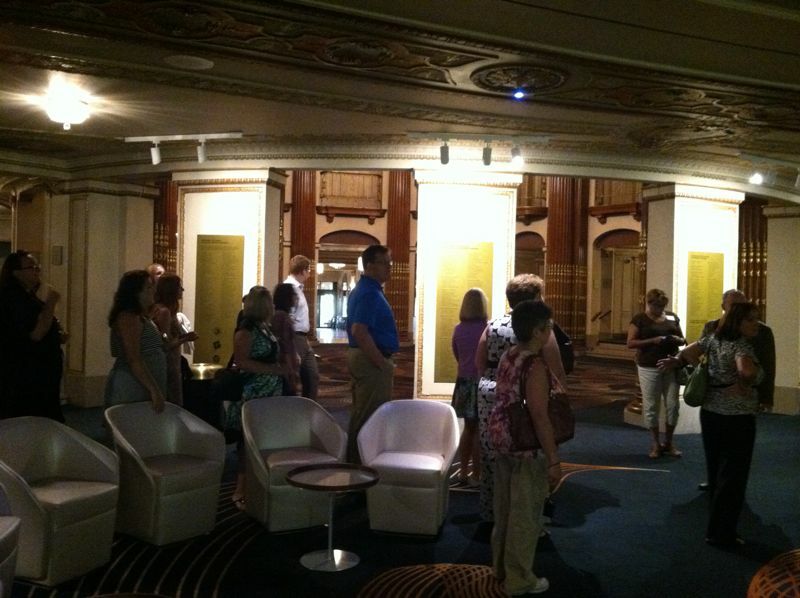 Our humorous and knowledgeable tour guide, Jim, then led us through a “secret passage” to the State Theatre, the largest theatre in the Playhouse Square complex. 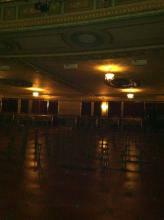 It was exciting to stand on the stage which, we were told, was as large as a high school gymnasium! 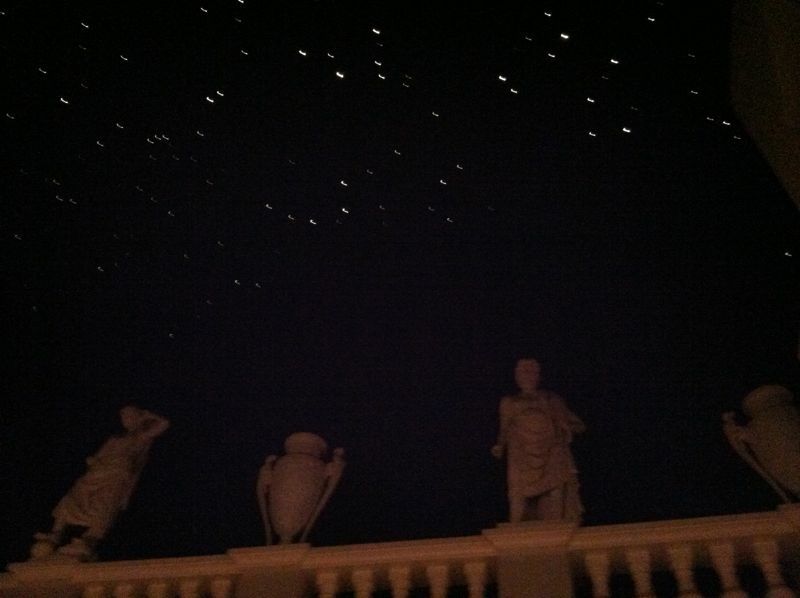 Looking out toward the seats of the theatre gave us an appreciation of the actor’s point of view. 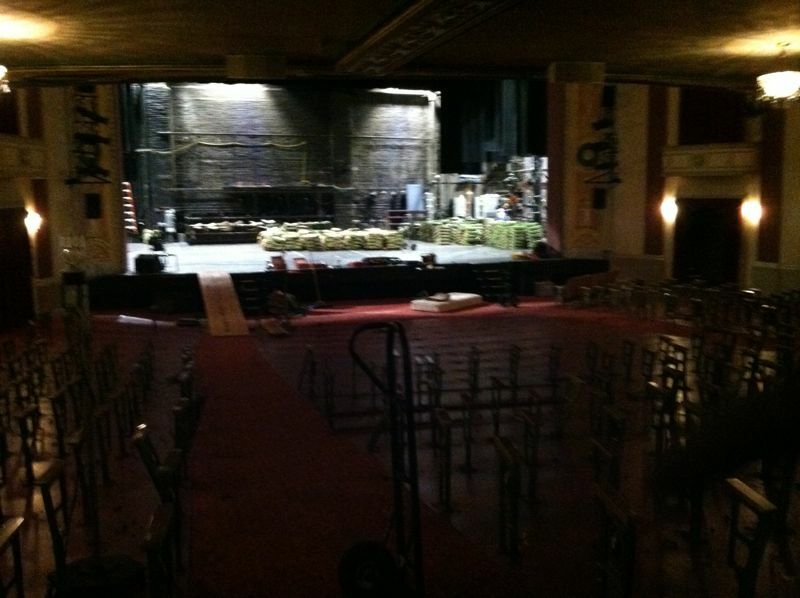 We saw some of the backstage dressing rooms, and heard stories about the stars who have used them, such as Yul Brynner, when he performed in “The King and I.” We have been on Playhouse Square tours before, but they are always fun, since we see different things and hear different stories each time. 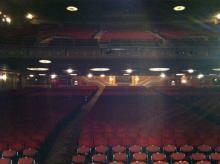 We then proceeded to the Ohio Theatre. 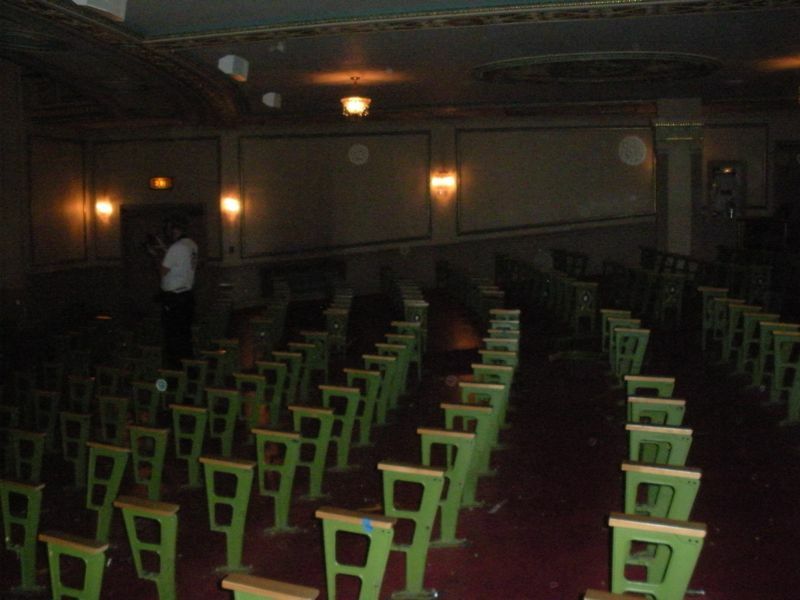 The lobby of the Ohio Theatre has rather plain-looking walls compared to the other theatres, because of the extensive damage done to the original walls. 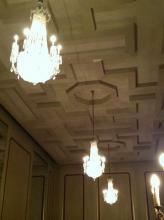 The current lobby did win an award for creative use of drywall--on the ceiling! The lobby’s sparkling chandeliers, as well as all the chandeliers in the Playhouse Square theatres, are cleaned by hand by volunteers! 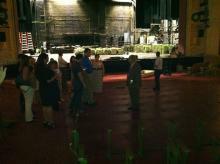 We learned during our tour that one of the key elements of Playhouse Square is renovation. It can be viewed as a Cleveland theatre project that is always evolving and growing. 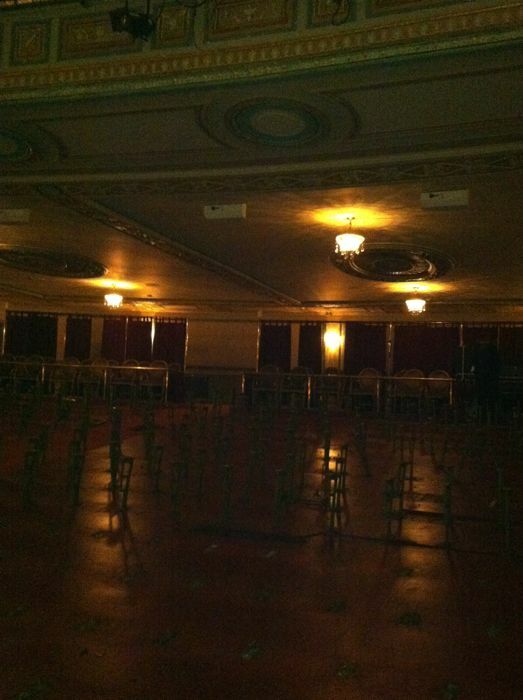 We saw a perfect example of this in the Ohio Theatre. All the seats had been removed, and only the uprights between the seats were standing. This was a unique sight! 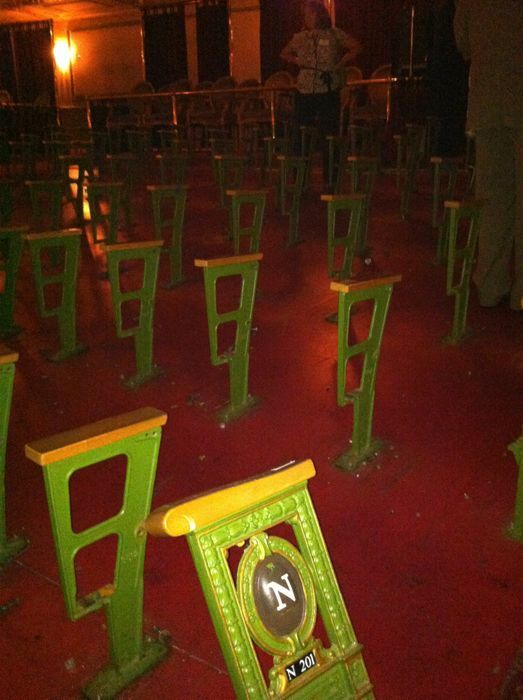 New and improved seats will be installed very soon. 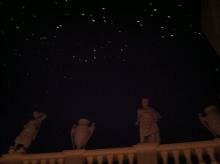 We also did a little “indoor stargazing” in the outer lobby of the Ohio Theatre. Its ceiling twinkles with stars 24 hours a day! 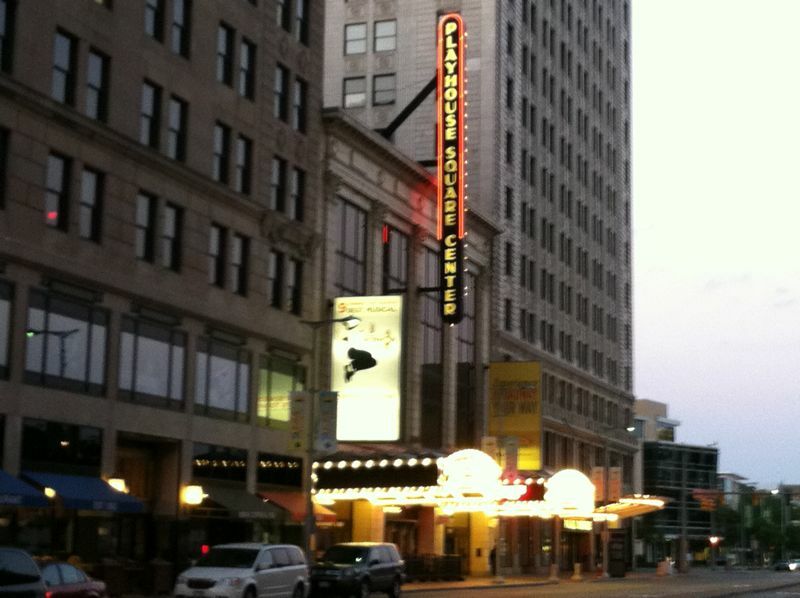 The Cleveland Play House Second Stage is one of the newest areas of the Playhouse Square complex. 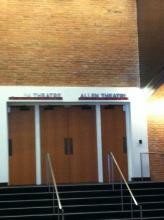 This was the first time we have seen this theatre! We learned that the seating, walls, and stage can all be moved to allow for different configurations. This gives a great amount of flexibility, and many types of plays can be performed here. 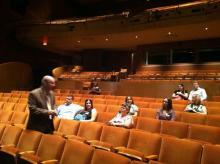 During our tour, the Second Stage Theatre was configured with a thrust stage. 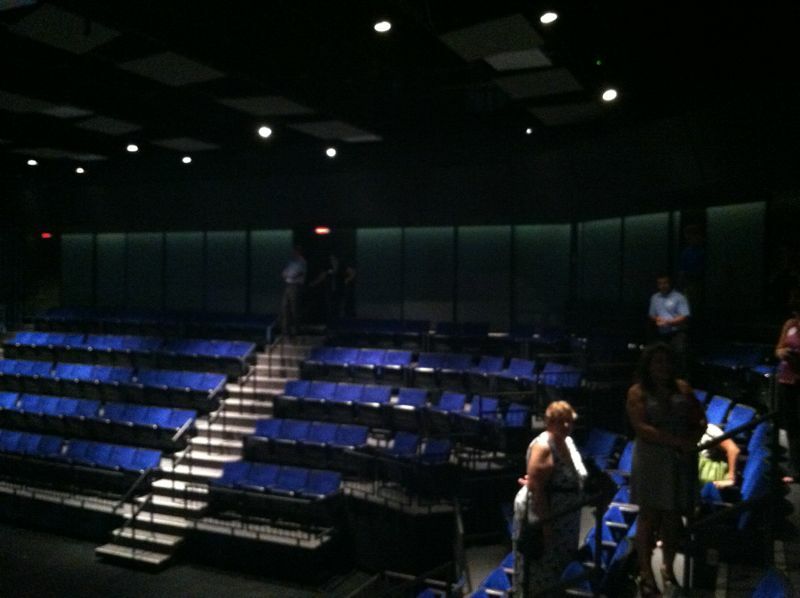 We love this style of theatre, since the thrust stage brings you close to the action. 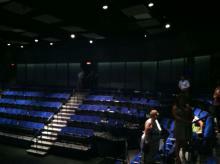 We look forward to attending a play in this new theatre someday. The new Allen Theatre is the main stage of the Cleveland Play House (CPH) (ClevelandPlayHouse.com - @ClevePlayHouse). It has special acoustical walls and ceiling designed to enhance the sound quality of CPH productions. Although the walls and ceiling have a very “modern” appearance, lighting can be adjusted so that the architectural features of the old Allen theatre can be seen through them when it is appropriate for a production. 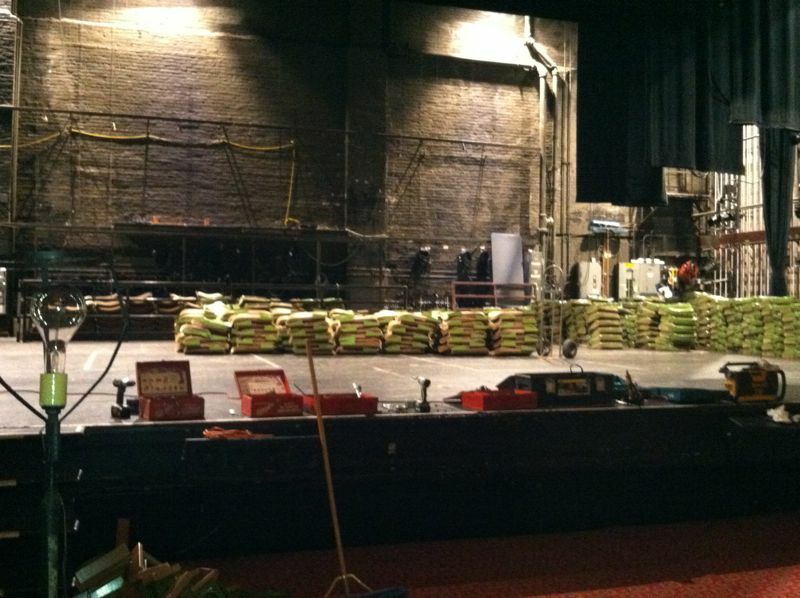 When the Cleveland Play House moved to Playhouse Square, we had a detailed tour of the Allen Theatre at the September 12, 2011, public open house. 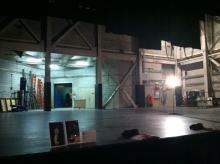 The Second Stage and the Helen Rosenfeld Lewis Bialosky Lab Theatre were not yet completed at that time. After seeing so many different types of theatres during the bloggers' tour, we are very curious to see the Lab Theatre as well. These facilities are now shared by PlayhouseSquare, the Cleveland Play House, Cleveland State University’s Department of Theatre and Dance, and Case Western Reserve University’s MFA Acting Program. 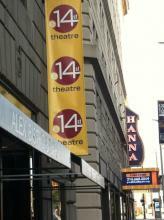 Across the street from the main Playhouse Square complex are the 14th Street Theatre and the newly-renovated Hanna Theatre. 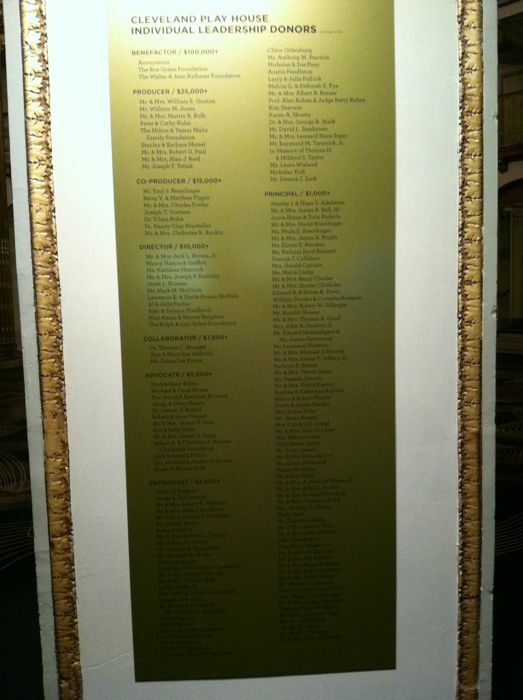 All of the theatres mentioned here, plus Kennedy’s Theatre and the Westfield Insurance Studio Theatre, make Playhouse Square the second largest theatre district in the country! 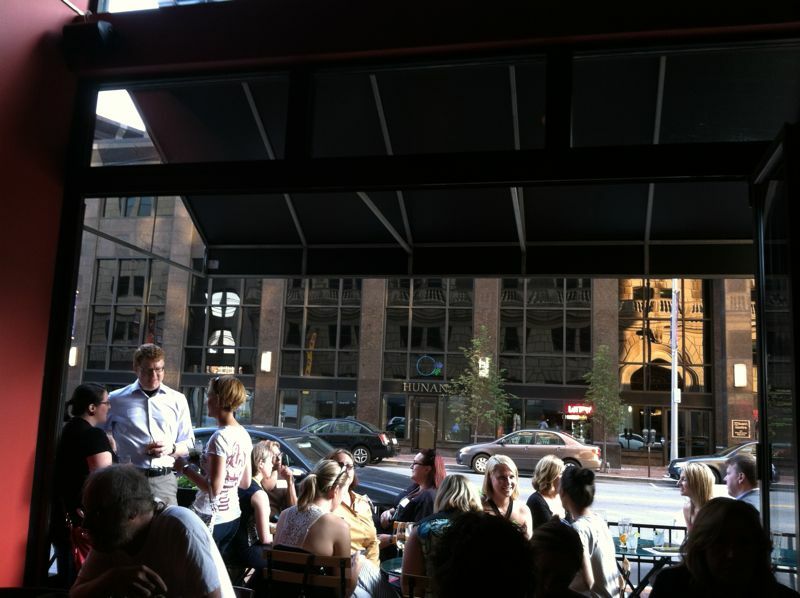 After the tour, everyone enjoyed some food, drink, and socializing at Alex Bistro and Bar (@AlexBistroCle) on E. 14th Street. Dave (@DaveCunix) from Health Insurance Issues with Dave and Again? Really? Jen (@WhyCLE) from Why CLE? Also joining us was @BalletInCleve (whose mission is to bring classical ballet back to Cleveland). Be sure to follow these bloggers on Twitter, and check out their blogs! Thank you, Ohio Blogging Association - Cleveland (@OHBlogging) and Playhouse Square Partners, for a fun and memorable evening! A special thank you to Alicia (@PoiseInParma) for organizing these great monthly social gatherings for Cleveland bloggers. 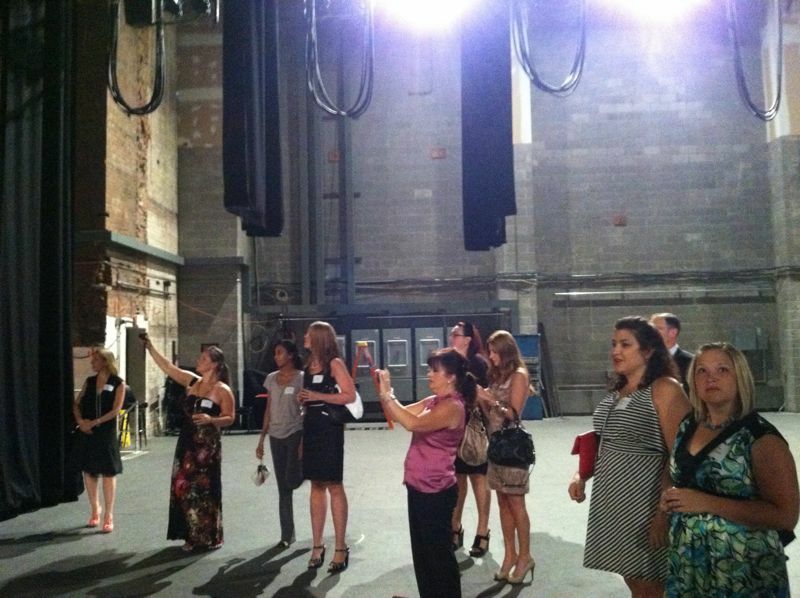 The next bloggers event is scheduled for August 16, 2012. We feel very lucky​ to have had the opportunity to go on this special bloggers private tour, but have also enjoyed participating in public tours in the past. 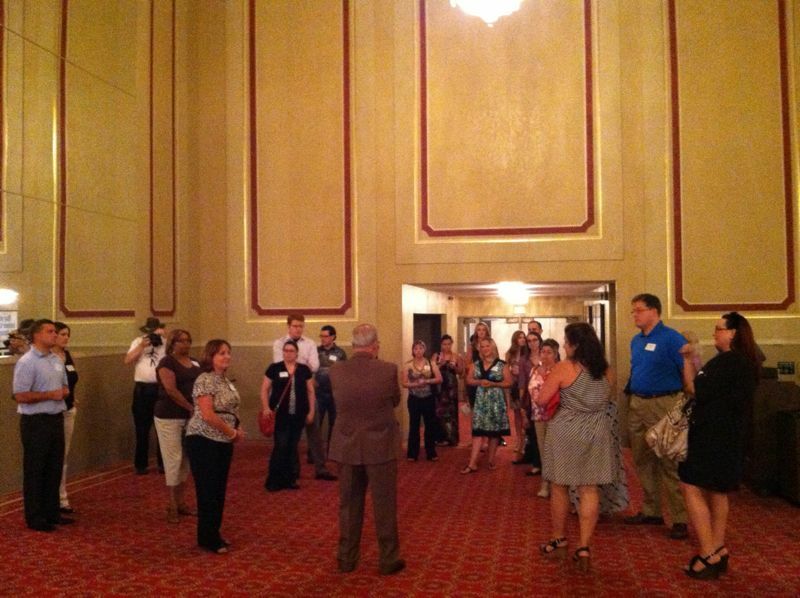 If you are interested in a tour of Playhouse Square, please see the public tour information. 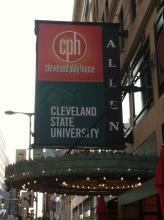 If you are a young professional in Cleveland, you should consider joining Playhouse Square Partners. Members help support Playhouse Square and take part in many special events and activities. 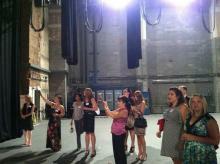 "No other YP group in town gives you such exclusive access and influence at one of the region’s leading cultural gems." Secret: We​ signed up for the Playhouse Square e-Alert for special promotions, and received free iTunes songs! We don't know how long this offer will be available, so sign up today to learn more about Playhouse Square. In addition to the videos about the shows, here are four "PlayhouseSquare Documentary" videos that gives a taste of the impact of this Cleveland nonprofit. It makes you think anything is possible when a community comes together for a greater good. Don’t mis​s the free Playhouse Square “Broadway Buzz”pre-show talk one hour before every show in Playhouse Square’s Broadway Series! 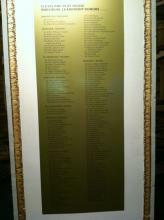 We have attended these for the last several shows. 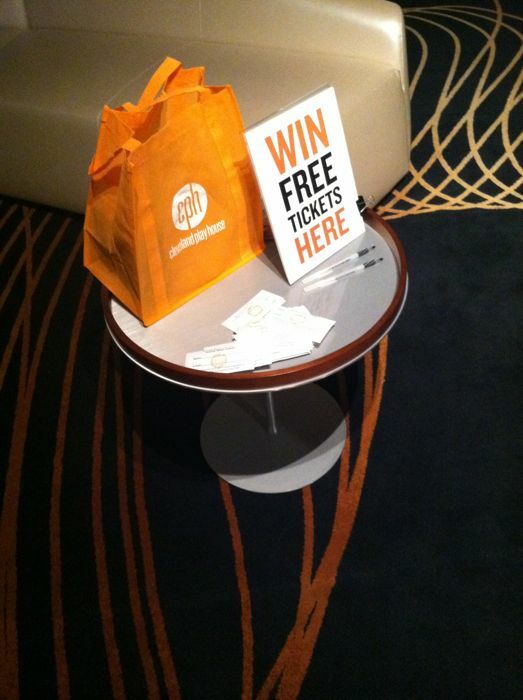 They are great fun and a wonderful way to learn more about the show you are about to see! Why? 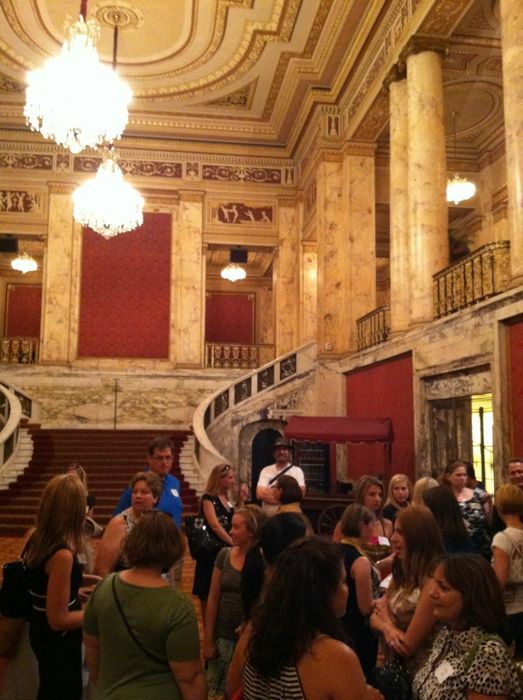 Ohio Blogging Association and Playhouse Square! Why CLE?· A blog about why we're here. 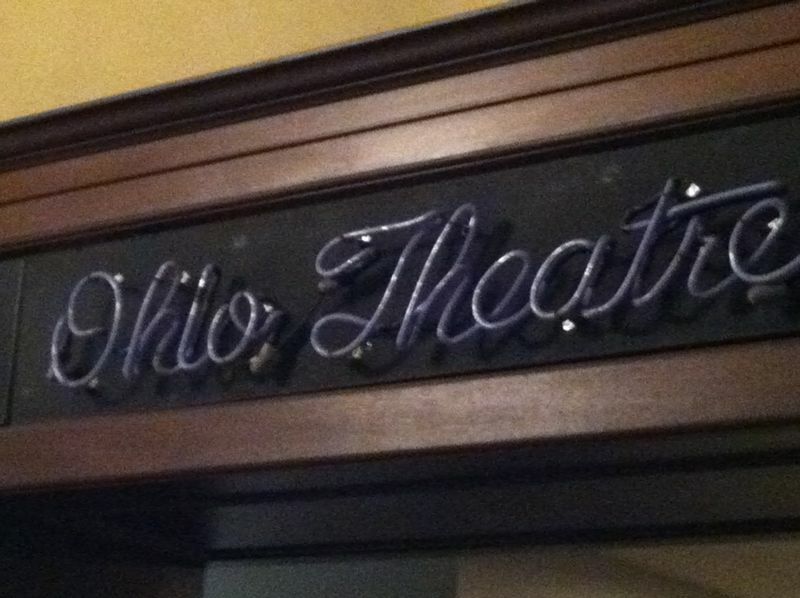 Looking forward to seeing the @OHBlogging folks and touring the fabulous @playhousesquare tonight! Note to self: next walking tour, wear flats! @ohblogging @playhousesquare I may be a little bit biased but tonight's blogger meetup was my favorite. 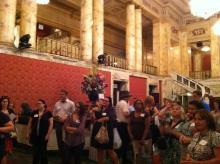 Such a fun night with @OHBlogging and @playhousesquare. Great meeting @balletincleve and hanging with the #tricountywivesclub. @EatDrinkClev @aityblog @WearingMascara @nidhizzle @KTOinCLE @MyRetroKitchen @alexbistrocle It was great hanging out with you all! 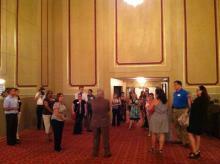 Thx @PoiseInParma for tonight's #Cleveland @OHBlogging tour of @PlayhouseSquare! We had a great time! U plan the best #HappyInCle events! @sos_jr @ClevelandChick thank you both so much for the kind words. happy to continue on the @OHBlogging fun! U R welcome! RT @poiseinparma: @sos_jr @ClevelandChick thank you both so much for the kind words. happy to continue on the @OHBlogging fun! Agreed! 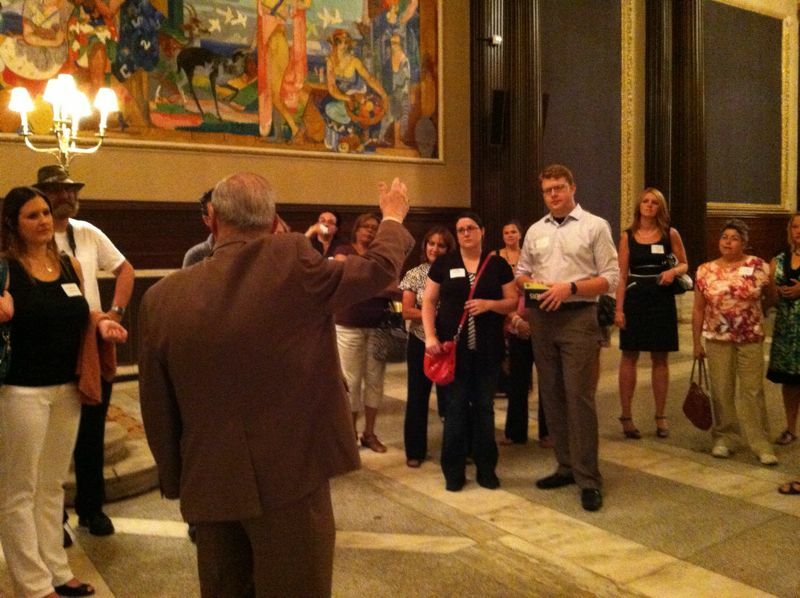 RT @sos_jr Thx @PoiseInParma for tonight's #Cleveland @OHBlogging tour of @PlayhouseSquare! We had a great time! I very much enjoyed @playhousesquare and @alexbistrocle tonight! Thank you @poiseinparma for another wonderful OH Blogging meet up! 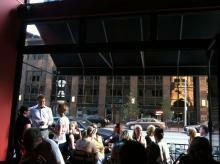 @EatDrinkClev @smittenincle @DinasDays @WhyCLE @sos_jr @poiseinparma Glad you all enjoyed your time here! See you again soon! 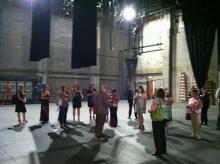 RT @sos_jrThx @PoiseInParma for #Cleveland @OHBlogging tour of @PlayhouseSquare! We had a great time! U plan the best #HappyInCle events! 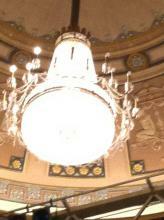 @playhousesquare Can't wait to visit again for a show! Thanks so much for having us. 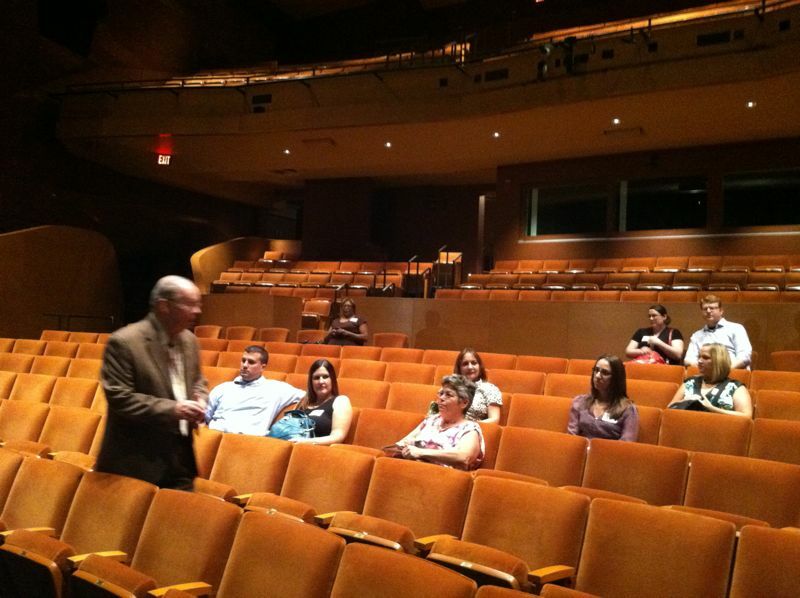 Please feel free to add your comments about the Ohio Blogging Association Theatre Tour with Playhouse Square Partners to this blog post. Thank you! Great post Stuart! You really provided a lot of detail and some great pictures. 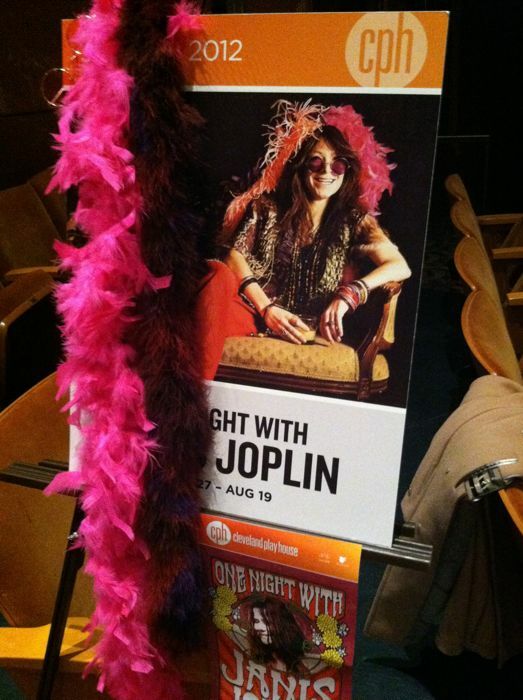 It was such a fun night!! Thanks Crystal! I am glad you enjoyed it. 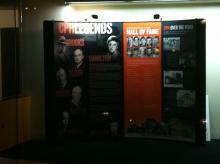 Julie and I had a great time putting it together. Reviewing the photos, links to other websites, and the Playhouse Square videos -- it is like extending the tour! Hi Stuart! 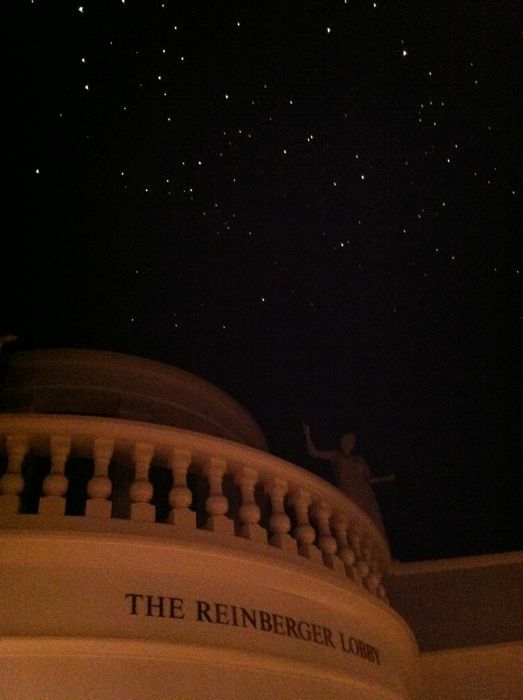 Thank you so much for taking the time to write such an awesome recap of your visit here. 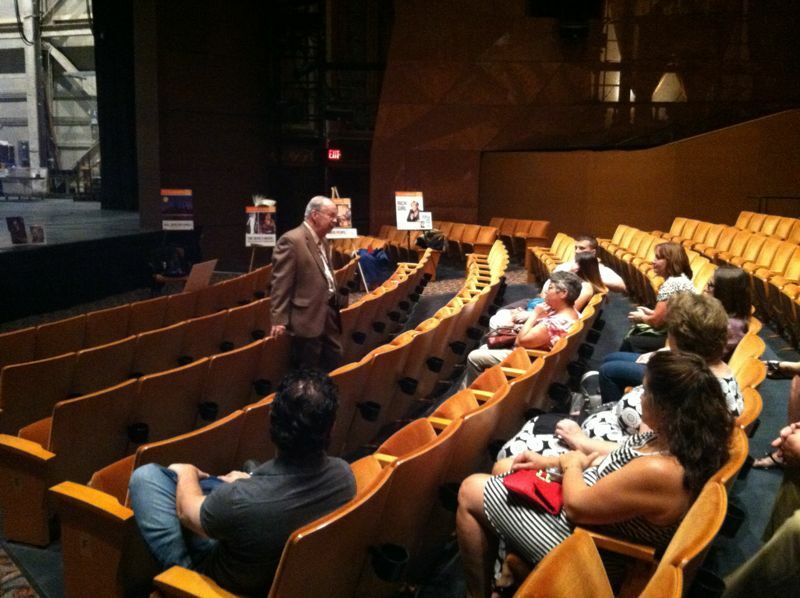 We're so glad that you enjoyed the tour and appreciate your support! Glad you liked our write-up. 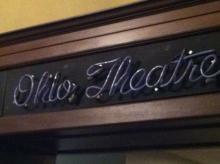 My wife and I enjoy every opportunity we have to visit Playhouse Square. 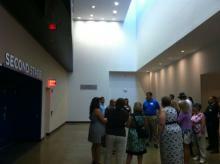 We especially enjoyed this tour with our fellow Cleveland bloggers. Thanks Julie! 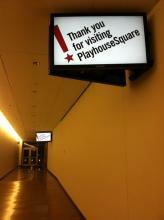 We enjoyed writing about Playhouse Square. It was a fun tour.